This article is about the year 1804. July 11: Burr shoots Hamilton. 1804 (MDCCCIV) was a leap year starting on Sunday of the Gregorian calendar and a leap year starting on Friday of the Julian calendar, the 1804th year of the Common Era (CE) and Anno Domini (AD) designations, the 804th year of the 2nd millennium, the 4th year of the 19th century, and the 5th year of the 1800s decade. As of the start of 1804, the Gregorian calendar was 12 days ahead of the Julian calendar, which remained in localized use until 1923. January 1 – Haiti gains independence from France, and becomes the first black republic, having the only successful slave revolt ever. February 4 – Sokoto Caliphate founded in west Africa. February 14 – The First Serbian Uprising begins the Serbian Revolution. By 1817, the Principality of Serbia proclaims self-rule from the Ottoman Empire, the first nation-state in Europe to do so. February 15 – New Jersey becomes the last of the northern United States to abolish slavery. February 16 – First Barbary War: Stephen Decatur leads a raid to burn the pirate-held frigate USS Philadelphia at Tripoli to deny her further use by the captors. February 18 – Ohio University is chartered by the Ohio General Assembly. February 21 – Cornishman Richard Trevithick's newly built Penydarren steam locomotive operates on the Merthyr Tramroad, between Penydarren in Merthyr Tydfil and Abercynon in South Wales, following several trials since February 13, the world's first locomotive to work on rails. February 22–April 22 – 1804 Haiti Massacre, an ethnic cleansing with the goal of eradicating the white population on Haiti. March 4–5 – Castle Hill convict rebellion in New South Wales led by Irish convicts in Australia. John Wedgwood founds the Royal Horticultural Society. Thomas Charles is instrumental in founding the British and Foreign Bible Society. March 10 – Louisiana Purchase, Three Flags Day: In St. Louis, a formal ceremony is conducted to transfer ownership of Louisiana Territory from France to the United States. March 17 – Friedrich Schiller's play Wilhelm Tell, is first performed at Weimar, under the direction of Johann Wolfgang von Goethe. March 21 – The Napoleonic Code is adopted as French civil law. April 2 – Forty merchantmen are wrecked, when a convoy led by HMS Apollo runs aground off Portugal. April 4 – Samuel Taylor Coleridge, aboard The Speedwell, sails to the Mediterranean. April 5 – The High Possil meteorite, the first recorded meteorite to fall in Scotland in modern times, falls at High Possil. April 26 – Henry Addington resigns as Prime Minister of the United Kingdom. May 10 – William Pitt the Younger begins his second term as Prime Minister of the United Kingdom. May 14 – The Lewis and Clark Expedition departs from Camp Dubois, and begins their historic journey by traveling up the Missouri River. May 18 – Napoleon Bonaparte is proclaimed Emperor of the French by the French Senate. May 21 – Père Lachaise Cemetery a 118-acre (0.48 km2) cemetery in Paris, France is opened. June 9 – Beethoven's Symphony No. 3 in E–flat premiered in Vienna. June 15 – The Twelfth Amendment to the U.S. Constitution is ratified by New Hampshire, and arguably becomes effective (subsequently vetoed by the Governor of New Hampshire). June 21 – Smithson Tennant announces the discovery of the elements iridium and osmium; three days later, William Hyde Wollaston reveals to the Royal Society that he is the formerly anonymous discoverer of palladium. 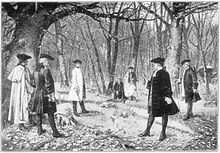 July 11 – Aaron Burr, Vice President of the United States, shoots former U.S. Secretary of the Treasury Alexander Hamilton during a duel; Hamilton dies the next day. July 27 – The Twelfth Amendment to the U.S. Constitution is ratified by Tennessee, removing doubt surrounding adoption. August 20 – Lewis and Clark Expedition: The Corps of Discovery, whose purpose is to explore the Louisiana Purchase, suffers its only death when Sergeant Charles Floyd dies, apparently from acute appendicitis. September 1 – German astronomer K. L. Harding discovers the asteroid Juno. October 5 – Action of 5 October 1804: War between Spain and the United Kingdom is triggered by the battle between four British warships (Indefatigable, Medusa, Amphion and Lively) and four Spanish frigates (Medee, Fama, Clara and Mercedes), all carrying treasure and merchandise. Captain Graham Moore of Indefatigable informs Spanish Admiral Jose Bustamente of his orders to detain the treasure-laden ships and, "not receiving a satisfactory answer, an Action commenced"; La Mercedes is sunk and the other three ships surrender. October 8 – Jean-Jacques Dessalines holds his coronation as Jean-Jacques I, Emperor of Haiti. November 3 – The Treaty of St. Louis is signed by Quashquame and William Henry Harrison; controversy surrounding the treaty eventually causes the Sauk people to ally with the British during the War of 1812, and is the main cause of the Black Hawk War of 1832. November 20 – Said bin Sultan, Sultan of Muscat and Oman, starts to rule. November 30 – The Democratic-Republican-controlled United States Senate begins an impeachment trial against Federalist-partisan Supreme Court of the United States Justice Samuel Chase, on charges of political bias (he is acquitted by the United States Senate of all charges on March 1, 1805). December 2 – Coronation of Napoleon I: At the cathedral of Notre Dame de Paris, Napoleon crowns himself as the first Emperor of the French in a thousand years. Witnessing this, Simón Bolívar dedicates himself to liberating Venezuela from Spanish rule. December 3 – Thomas Jefferson defeats Charles C. Pinckney in the United States presidential election. December 12 – Spain declares war on the United Kingdom. The Nguyễn dynasty emperor Gia Long changes his country's official name from Đại Việt to Việt Nam. Morphine is first isolated from the opium poppy by the German pharmacist, Friedrich Sertürner. Matthew Flinders recommends that New Holland be renamed Australia (from the Latin "australis" meaning "of the south"). World population reaches 1 billion people. December 25 – Contarina Barbarigo, famous Venetian noble. ^ Rattenbury, Gordon; Lewis, M. J. T. (2004). Merthyr Tydfil Tramroads and their Locomotives. Oxford: Railway and Canal Historical Society. ISBN 0-901461-52-0. ^ Gaffield, Julia (2015). Haitian Connections in the Atlantic World: Recognition after Revolution. Chapel Hill: University of North Carolina Press. pp. 83–84. ^ Whitaker, Anne-Maree. "Castle Hill convict rebellion 1804". Dictionary of Sydney. Retrieved March 3, 2013. ^ "Our timeline". Bible Society. Retrieved November 26, 2010. This page is based on the Wikipedia article 1804; it is used under the Creative Commons Attribution-ShareAlike 3.0 Unported License (CC-BY-SA). You may redistribute it, verbatim or modified, providing that you comply with the terms of the CC-BY-SA.